Social media has by now surely for most companies gone from an interesting to an established communication channel. In adapting to new rules of marketing that requires engaging with consumers an organisational change is often evaluated. A new title starting to emerge in many marketing organisations is the Community Manager. This is a new role and also a new contact point for many agencies. As we also offer this resource from an agency perspective – we sometimes get met with the question: But don´t you really think this have to be done by the company itself? We have/are thinking about hiring one to deal with all this ourselves. For companies that have a large in-house production this could very well be a good idea. Makes the same sense and has the same pros and cons as having an inhouse department for other medias. If you already integrate communications in all channels by yourself you might just need external consultancy for specific strategic or creative input. We are fine with that. If you think that this is not so important, can be handled by someone with relatively little marketing experience and not worth investing in, we generally tend to disagree. For the majority of consumers today digital channels are being used as a primary way of getting information on companies, brands and products. Social media is one of the few ways of easily getting a personal contact with a brand of interest. It is also a place where brands have to engage with consumers on their own terms. One can argue that the community manager responsible for handling this interaction has to be very experienced and skilled in general communications. Interactions can handle many different aspects of the brand and occur in real time. In fact, the community manager will act very much as a marketing director in managing, co-ordinating, prioritizing both messages and production. Very few marketing directors do this themselves and successful ones tends to involve their staff and consultants to maximize the effect of their output. The community manager must also have Distributor skills (Knowing about how several platforms work, How publishing is performed and packaged, how consumers in their turn can help him seed and enrich material and how organic support and followers are built and kept. Producer skills will also be needed (as creative ideas and material needs to ordered, created, adapted and initiated for digital channels, used with visual design that follows the rules of different platform. Being able to work with rich media to cut through the digital noise will also be a necessity). 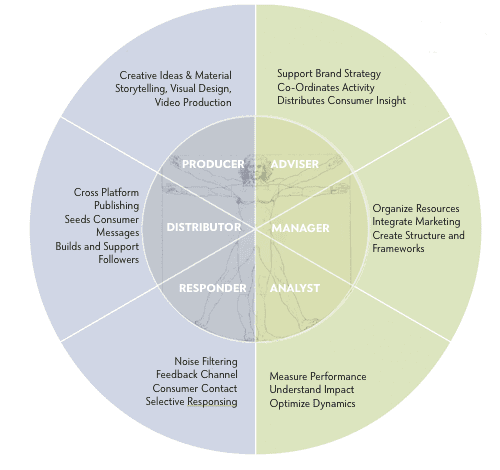 And finally he/she should also be an Analyst (ready to distributes consumer insight gained, evaluate and measure digital performance, understand the dynamics that aggregate impact and being able to optimize all that data available into more effect. Yes, that are some pretty big roles to play. Of course this work will be a lot easier as more marketing functions naturally integrate their work and treat social media as a natural on-going representation of their brand and their own work. Then it will become closer to how you handle traditional marketing. Though, this is still constantly on-going, most often requires new digital skills and need to be carefully planned to make resources last. So, back to the question – Should you do community management yourself ? Maybe, if you do your other marketing in the same manner and have great resources for this internally. Just don´t hire a community manager and expect them to be good at all these roles all alone. Then it might be a good idea to support surely a capable digital agency can help your community management do a lot better.